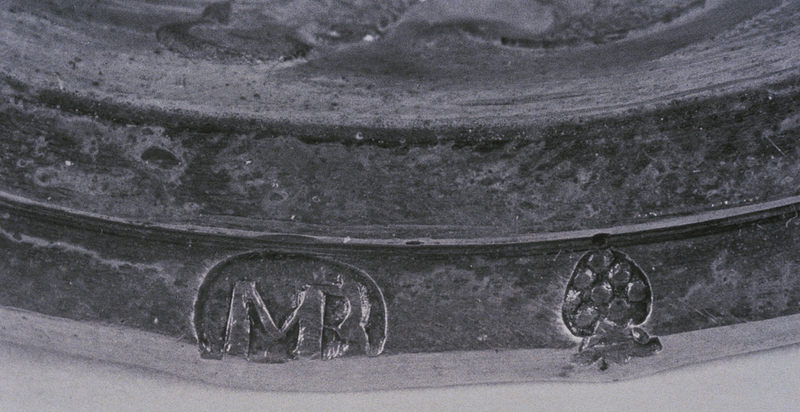 Stamped on the brim of the cover with the monogram "MB", the mount maker's mark of Martin Bair (Augsburg 1676-1734). Engraved on the lip mount, " SEI WILLKUMEN HAUS - SEZ AN UND TRINK AUS - TRAG FRID NIT HINAUS - ". Markings: Stamped on the brim of the cover, a pinecone for the city of Augsburg. Inscription: Inscribed on the lip mount, "SEI WILLKUMEN MEIN HAUS - SEZ AN TRINK AUS - TRAG FRID NIT HINAUS". 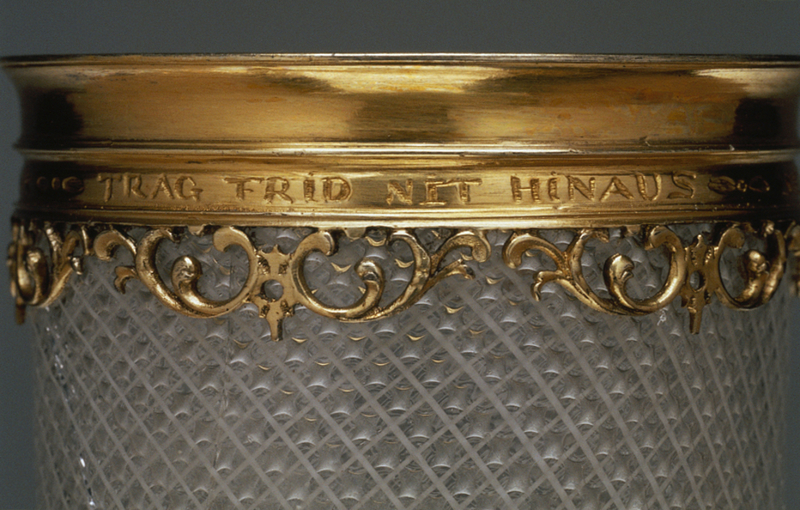 Engraved around the silver-gilt lip of this covered beaker are the German words SEI WILLKUMEN MEIN HAUS--SEZ AN UND TRINK AUS--TRAG FRID NIT HINAUS (Welcome to my house--put me to your lips and drink me dry--don't take contentment away). The beaker held a large quantity of beer that was often shared communally. 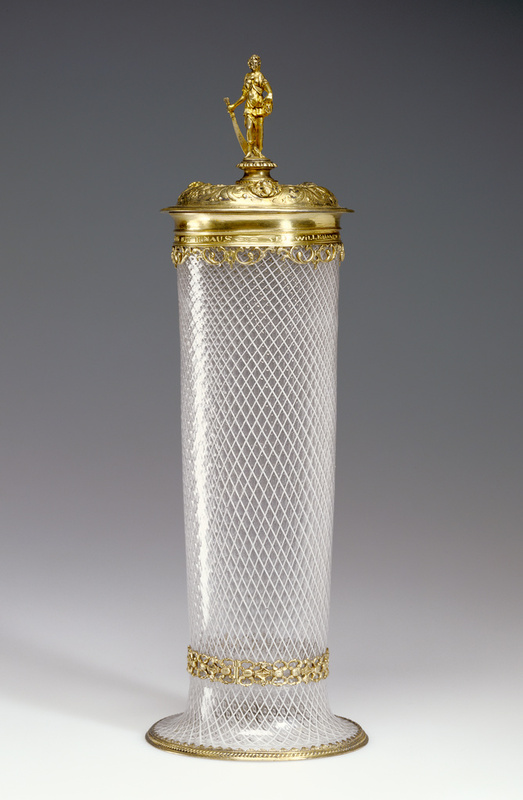 An Italian craftsman working either in Murano, a Venetian island, or in a German glasshouse made the delicate filigree glass beaker. Around 1685 a German silversmith in Augsburg added the silver-gilt mounts and the cover, topped with the figure of Judith holding the head of Holofernes. "Acquisitions/1984." The J. Paul Getty Museum Journal 13 (1985), p. 246, no. 193. The J. Paul Getty Museum Handbook of the Collections. 3rd ed. (Malibu: J. Paul Getty Museum, 1991), p. 208. Bremer-David, Charissa, et al. Decorative Arts: An Illustrated Summary Catalogue of the Collections of the J. Paul Getty Museum (Malibu: J. Paul Getty Museum, 1993), p. 220, no. 382. The J. Paul Getty Museum Handbook of the Collections. 4th ed. (Los Angeles: J. Paul Getty Museum, 1997), p. 246, ill.
Hess, Catherine, and Timothy Husband. European Glass in the J. Paul Getty Museum (Los Angeles: J. Paul Getty Museum, 1997), pp. 167-69, no. 44. The J. Paul Getty Museum Handbook of the Collections. 6th ed. (Los Angeles: J. Paul Getty Museum, 2001), p. 246, ill.
Wilson, Gillian, and Catherine Hess. Summary Catalogue of European Decorative Arts in the J. Paul Getty Museum (Los Angeles: J. Paul Getty Museum, 2001), p. 227, no. 463.